Kathryn gets Chakotay's help to thank the crew. How could a person be so frustrated when everyone else tried to be so nice? Kathryn Janeway didn't know the answer, but it was her state of mind on that particular day. The morning had an ordinary start. The computer woke her at 0700 as usual. After downing her first cup of coffee of day, she showered, dressed, and walked to the mess hall. After the customary argument with Neelix about what she would have for breakfast, Captain Janeway took her toast and second cup of coffee to an empty table. Everyone seemed to know that the captain wanted to be alone because no one joined her until Chakotay came into the room. A few moments later, Chakotay put his filled tray on the table across from her and sat down. His greeting was typically cheerful. After a few minutes of exchanging pleasantries, he began to eat. The very ordinariness of everything Kathryn had experienced since waking caused her to feel tense. When she tried to understand what was bothering her, the reason escaped her. The tightness in the back of her neck began to throb and the unwelcome signs of a headache began to manifest. She fought the desire to reach up and rub her neck. There was no way she wanted to give Chakotay a clue as to how she was feeling. Finally when the pain started to push behind her eyes, she gulped down the last of her coffee, and sliding away from the table, she excused herself, planning to head for the bridge. However, before Janeway made it away from the table, Crewman Boylan appeared at her side and offered to take her tray. Something like that happened to her almost every morning. But at the moment all she wanted was to tell the young man, "No thanks, I'll do it myself." However, she merely thanked him, and left the mess hall. Almost as soon as she arrived on the bridge, Kathryn went to the ready room and found the hypospray of analgesic that the doctor had given her for such times. As the medicine took affect, she grabbed a stack of PADDs and walked to the replicator. There probably weren't enough rations for an extra cup of coffee today, but she decided to check. The computer couldn't be right. She was sure that she had barely enough credits to get 3 cups a day until the rations were refreshed at the beginning of the month. However, right there on the screen beside her name was a number that would more than meet her caffeine wants for the rest of the month, almost as much as when the month began. Captain Janeway pondered what to do next. Of course she ordered that cup of coffee, but the reports in her hand were forgotten as she tried to figure out who had replenished her rations. "Chakotay, to the ready room." Soon Chakotay was standing in front of her desk, a look of mild curiosity on his face. "What can I do for you, Captain?" Without a word, Kathryn turned the monitor around so that Chakotay told see it. Sighing at his lack of comprehension, she said, "Explain these numbers." "It appears to me that you have been cutting back on coffee and mocha ice cream. Good job, Kathryn." His grin was cheeky. "Don't give me that, 'Good job, Kathryn.'" She leaned back and crossed her arms. "You know me better than that. When was the last time, I had so many rations this late in the month?" Tugging on his ear, Chakotay tried to use a serious tone. "I suppose when you came back from being assimilated. The doctor wouldn't let you have anything remotely like coffee for three weeks." He added with a wink, "It was hell around here during that time if I remember right." Kathryn choked out a laugh. "You are incorrigible, Commander." She felt her neck and shoulders relax slightly as she reached for her coffee cup. "I have been told that a few times." Chakotay's smile was full and dimpled by then. She wondered if she would ever get tired of those dimples. Giving herself a mental shake, Kathryn stood up, walked to the replicator, and ordered Chakotay's favorite tea. "Let's go sit down and discuss this mystery ration multiplication." Cup in hand, Chakotay sat next to his captain. "You know that there are some things an officer can't discuss even with his captain. He is bound by confidentiality." Reclining against the back of the couch, Kathryn took a long swallow of her coffee. This was more soothing than the hypospray, and much more enjoyable. "Do I have to order you to tell me what is going on?" Her smile belied the severity of the question. The warmth of his responding chuckle seemed to cover her whole being. At that moment she didn't care where the extra rations came from, but she wasn't ready to concede. "Oh, you think I won't?" Chakotay merely sipped his tea, allowing his eyes to convey his amusement. "I know that you would try." "Why won't you tell me?" Kathryn knew her voice was rapidly approaching the wheedling stage but she was past caring. Sighing, the captain brought her cup to her lips and drained it. 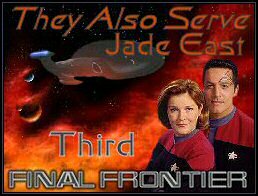 Almost before she could even think about going for another, Chakotay had taken it from her, had it refilled, and handed it back to her. This brought a smile to her face. Patting his arm as he set back down beside her, she said, "Thank you, Chakotay. I don't know how you do it." "It's very easy." He pretended to misunderstand. "You only have to speak your order to the machine." The laughter that came from Kathryn was the delicious, delighted kind that only comes when caught off guard by silliness. The last of the tension left her as she enjoyed the moment. They sat in silence for a few minutes, sipping their beverages. Kathryn liked these times and wondered why she didn't allow herself to indulge in them more often. How was it that she had become so wrapped up in other things that she hadn't spent more time with her best friend? She set her cup down and turned slightly so as to face Chakotay. "If you can't tell me who, then tell me why or how?" "The how isn't really important." Chakotay was facing her, a more serious look on his face. "But I think the why will make you uncomfortable." There was something in his tone or the look in his eyes that made her even more anxious to know than before. Chakotay was giving her an out and for once she was not going to take it. "I want to know." Chakotay searched her eyes, trying to divine the truth of her simple statement. He nodded and said, "Okay, then. You are loved." Hurrying on before she could speak. "This crew loves their captain far more than most would. As you well know, ours is a unique situation. After your time in the collective, several of the crew came to me asking if they could help you in some way, if they could do something extra for you. I assured them that you would be more than satisfied if they did their jobs, but they wouldn't hear of it. They wanted to serve you in a unique way that would mirror what you have done for them." Pausing only to take a sip of his tea, he went on. "Someone finally came up with an idea that each of them could add a ration or two to your account. Since there was no harm in it and no protocols against it, I figured why not? It caught on so well that I have limited how many are allowed to contribute each month so that you wouldn't catch on. And you didn't for six months. I'm not sure why you figured it out today of all days, but that is the why." Kathryn sat in silence, her eyes stinging with unshed tears, her heart full of guilt. The crew of the Intrepid class starship, Voyager, were doing their very best to love and serve their captain. And all she could think of was how ordinary and routine the day had been. She couldn't continue to take the crew or this wonderful man sitting next to her for granted. Unsure of what to do next, she said softly, "Thank you, Chakotay for doing all this and for telling me. I needed to know." "I'm sure that I speak for the entire crew when I say, 'it is a pleasure to serve you.'" "What did I ever do to deserve you?" Reaching out, Kathryn took his hand. "You followed orders." He squeezed her hand. "Be serious!" She slapped at him with her other hand and smiled. "I know I'm trying to be." "Well, questions like that are hard to answer." His face took on a sober look. "I could ask you the same question. However I don't think I will. When I think about the way we serve together, I just end up thanking the spirits and leave it at that." Kathryn stood up and walked to the portal, pausing to stare out at the fleeting stars. She turned to look at Chakotay who had remained seated. "I want to find a way to thank the crew." "That isn't necessary. No one is doing these things for thanks." As she walked back to sit down again, she said, "I do know that. It is just something I have to do." Chakotay was silent for a while before he walked to Kathryn's desk, looking through the stack of PADDs until he found what he had been looking for. "This may be just what you're looking for." Taking the report from him, Kathryn scanned the contents of the Astrometric's report. After taking several minutes to decipher Seven's elaborate list of facts and figures, she looked up with a gleam in her eye. "An M-class planet with no civilization! Perfect for shore leave! I can't remember the last time that we had a one just for R and R."
For the next few hours, the two senior officers planned the logistics of a full crew shore leave. They decided that landing the ship, if a safe site could be found, would be the best way to relieve the most crew for the greatest amount of time. The captain and the commander would take the bridge watch at 12 hours shifts. The barest skeleton crew would be needed to keep vital systems going. The crew would have the choice of sleeping aboard or of sleeping in the various temporary shelters that would be set up on the ground. Lastly they made a sign-up list for the galley. Neelix was going to have R and R as well as the rest. One meal each day would be served while extra rations would be given out for meals off-ship. By the time Kathryn stood up from the table they had been working over, a satisfied smile graced her face. "I want to have a senior staff meeting right after lunch. See to it while I check with Harry and Seven for the latest scans of the planet." In the time it could Voyager to reach "Risa II" as the crew had taken to calling the planet, the ship had become busy with preparations for the break. However, no one neglected his or her duties. In fact, it seemed that the crew worked harder to make sure that nothing would go wrong while they were planet-side. The morning that "Risa II" was visible on the screen, long range, many crewmembers found a reason to come to the bridge. Janeway caught her XO's grin of understanding when Neelix and Naomi arrived with a plate of misshapen cookies they had made for a picnic on leave. "Permission to speak freely, Captain." Naomi stood next to Janeway's chair, at attention. Kathryn struggled to keep from chuckling, as she replied, "Of course, Assistant Wildman." "Neelix and I baked these cookies," she beamed with pride. "We thought it is only right to share with you and the commander since you aren't going to the surface much." Taking the plate from the young girl's hand, she turned to offer some to Chakotay. When she took a bite of one, she was pleasantly surprised at how good they were. "These are delicious, Naomi. I hope you saved some for yourself." "Oh yes, Captain," Naomi assured her. "We have lots." She launched on a description of the plans that her mother and Neelix had made for their leave. The doctor cheerfully served as a back up transporter operator after he was given the choice of holodecks or short tours of the planet. It didn't take much to persuade him it was best for the safety his program and for his holo-emitter if he restricted his time on the planet. The week the crew spent planet side went much faster than Kathryn had expected it to. Of course, it was a little hard to get used to the silence, few people around, no warp engine vibration, and no stars flashing by the portal. However, there always seemed to be someone in the mess hall who was ready to share an account of time spent on the surface. She rarely saw Chakotay, but he did leave her notes, some just small talk and some sharing the shore leave stories he heard. Kathryn even enjoyed busing tables for the few who came to eat onboard. Doing the ordinary jobs of others had a surprisingly relaxing effect upon her. It was as if she was able to shift the weight of command off her shoulders for a while. Smiling as she recycled the last of the dishes and put the leftovers in stasis, Kathryn tried to remember when she had last been this relaxed. Tomorrow the crew would begin coming back onboard. Her feelings about going back to normalcy were ambivalent, but she decided not to spend time fussing over it. Duty was just that. Arriving back at her quarters, she was just keying in her entry code when she heard footsteps in the corridor. Kathryn was surprised to see Chakotay coming toward her. "Is there something wrong?" Chakotay's grin put her apprehension to rest before he spoke. "Nothing that bridge duty didn't cure." He chuckled at her raised eyebrows. "It seems that Neelix accidentally came across the cave that Tuvok had been using to meditate in. Sometimes our morale officer just doesn't know when to let things be. I think it was the Talaxian camp songs that drove our tactical officer to cut short his leave." "Would you like a cup of tea?" Kathryn offered as her doors swished opened. They sat long into the evening talking about whatever they felt like, enjoying the gift of time together with no schedule or interruption. The third time that Kathryn stifled a yawn, Chakotay stood up to go. "I think it is well past your bedtime, Captain. Thanks for the tea." Kathryn laughed, "You sound like a first officer. And the pleasure was mine." On a whim she reached up to kiss him on the cheek. The look she saw in Chakotay's eyes before he walked through the door kept her up for an hour. It wasn't an ordinary glance. She hadn't seen anything like it for a very long time. Pondering her strong wish to see him look at her that way again, sent her into lovely dream-filled sleep. With "Risa II" looming large on the view screen, the day of departure, the mood on the bridge was relaxed and cheerful. There hadn't even been a case of sunburn to spoil the time. The leave had been almost clichedly perfect. Even Tuvok seemed more serene - a Vulcan's version of vacation rested. Kathryn was almost reluctant to give the order to leave orbit. First she decided to speak to the crew. "Open ship wide comm!" "The comm is open, Captain." Kim told her after a moment. "This is the captain. We are about to leave orbit. I hope that you all enjoyed your time off. I want to personally tell you how much I appreciate each one of you. I doubt if there is a finer crew anywhere, in any quadrant. This leave was just a token of my gratitude. Voyager crew, I salute you." Signaling for Kim to close the transmission, Janeway said, "Tom, let's get on our way. Set a course for home." "Aye, Captain!" was Tom's reply as his hands flew over the helm controls. However, a few minutes later he turned in his seat to face his commanding officer. "Captain, I know I speak for everyone when I say we all had a great time. It was one of the best shore leaves I can ever remember. I have one question though." He glanced at Chakotay before he continued speaking, "Commander Chakotay didn't take a turn on the surface. I'm sure you intend to thank him. Are you going to give him a week off duty or something?" Kathryn went white for a second before turning red. She hadn't given a thought to a way to thank Chakotay. He had seemed such an extension of herself as they were working on planning the crew break that she had neglected the most important thank you of all. Never once had he seemed to expect anything more. How could she have been so inconsiderate? Not looking at Chakotay, she tried to figure out what to say. Finally she blurted out, "I plan to give him something very special." "I think I know something he would like." Tom was enjoying the captain's discomfort. "Paris!" Chakotay's retort was quiet but threatening. Tom knew when he was whipped so he turned back to his station. The silence on the bridge was extreme. Kathryn was trying to think of something to say or do when Chakotay leaned closer and said softly, "May I speak to you in private, Captain?" Janeway nodded without looking at him. She stood and said with as much calm as she could muster, "Tuvok, you have the bridge." In the middle her ready room, she stood staring at the bulkhead. Kathryn still had no idea what she would say to Chakotay. When had she begun to take him for granted again? Sighing deeply, she turned to face Chakotay, although she didn't look up. "I'm sorry." "Kathryn, look at me." Chakotay was very close when he spoke. When Kathryn lifted her eyes, he could see the self-torture in them. He put his hand on her shoulder. "You didn't do anything wrong. You have no idea how much I enjoyed spending time with you while we planned this shore leave. And, bless Tuvok; we were even able to have an evening of just Kathryn and Chakotay. You don't have to thank me." Pulling away from him, Kathryn wrapped her arms around herself. Why was he so blasted understanding and supportive? She felt worse because there was no recrimination from him. It went deeper than lack of an expression of gratitude. Suddenly she knew that there was more in her heart that she had ignored than thankfulness. If she weren't careful, the straw man of protocol would be toppled. Chakotay stood in silence behind her for several moments before he touched her shoulder again. "Listen to me. If I wanted shore leave, all I would have had to do was ask. I know that you would have figured out a way to make it happen. I was far happier helping you to thank the crew." He felt her relax slightly so he gently turned her to face him. "I have many things to be thankful to the crew for as well." When Kathryn nodded, he continued, "But I have even more to be grateful to you for." What he said lifted more of the guilt. "I must repeat myself. What did I do to deserve you? And none of this, 'You obeyed orders.'" She shook her finger at him. "No, ma'am." He grinned as he ran his hands up and down her arms. "But I did just think of a small token of appreciation you could give me." Chakotay's face softened into a hopeful but less confidant smile. "That's if you really need to." Moving forward slightly Kathryn laid her hands on his chest. Her heart was pounding with foreknowledge of what he was going to ask. Her mind was ready to knock down the wall protocol had built. It was about time to live out her gratitude. Involuntarily she moistened her lips, as she spoke. "And what might that token be?" Chakotay pulled her closed into his arms, bending so that his mouth was millimeters from hers. "A kiss." He waited, not closing the distance himself. The warmth of his breath, as he whispered his request, made her shiver with delight and anticipation. "A kiss." There wasn't another thing she wanted more at that moment. She traveled the uncharted space, the expanse that she had longed to journey for so long. At first the kiss was soft, delicate. They both seemed reluctant to rush what had taken so long to happen. One of them sighed or maybe they both did, but it didn't matter, as they relished the sensations. Chakotay gasped with desire as Kathryn pushed passed his lips with her tongue. As her hands traveled to fist in his hair, she tried to pull him closer. Neither of them knew what would have happened, if there hadn't been an interruption. For a few fevered seconds, neither of them could comprehend the sound that had thrown itself into their private moment. Suppressing a sigh, Kathryn leaned her head against Chakotay's shoulder before she answered the hail. "What is it, Tuvok?" "I have been asked by several members of the crew to convey to you a proposal." Tuvok seemed to be measuring his words. "I believe the exact words were, 'a great way to kill two birds with one stone.'" "What kind of proposal, Tuvok?" "It would seem that there is a pool of three days worth of holodeck hours and leftover replicator rations at your disposal." Chakotay and Kathryn heard an excited muttering interrupt the tactical officer before he could continue. After some muffled interchange, Tuvok resumed, "To be more precise, at the disposal of both you and the commander. Mr. Paris suggested that you use them immediately as neither of you had the opportunity for R and R while the rest of us did." "Thank you, Tuvok, for relaying this suggestion." She grinned up at Chakotay and winked. "The commander and I will take it under advisement. Janeway out." "I think that is a wonderful suggestion, my dear captain."